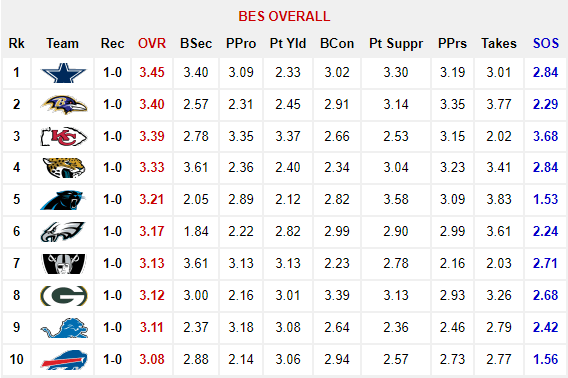 Week 1 of the 2017 regular NFL season is in the books thus another volume of BES Rankings is officially launched. 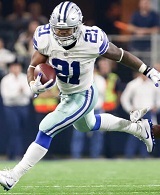 The Cowboys (1-0) open the season at No. 1 after conquering the Giants (0-1) 19-3, avenging a 2016 season in which they were swept by the G-men. Last season, the Cowboys enjoyed a four-week reign atop our rankings en route to securing the top seed in the NFC. 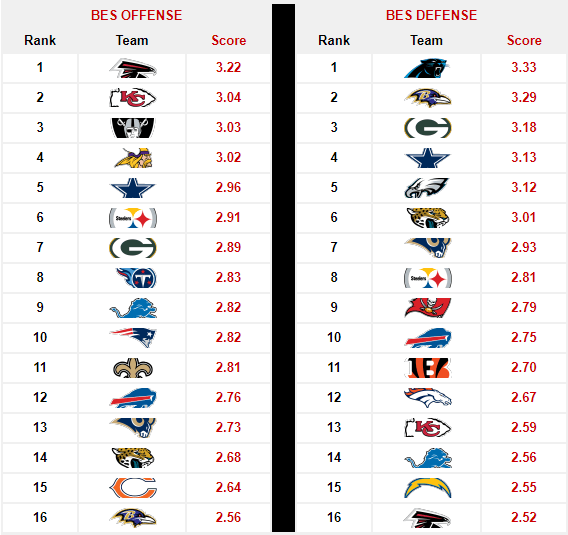 This year, they begin as the only team to rank among the top five in BES Overall (1st), BES Offense (5th) and BES Defense (4th). On the Cowboys’ coattails are the Chiefs (1-0) at No. 3 after a shocking Thursday Night road win over the Patriots (0-1). The Chiefs came from behind, scoring 21 unanswered fourth quarter points to secure a 42-27 victory. Rookie Chiefs halfback Kareem Hunt made the most of the prime time stage, amassing 246 yards from scrimmage and three touchdowns. Chiefs quarterback Alex Smith was just as stellar, completing 80% of his throws for 368 yards and four touchdowns. 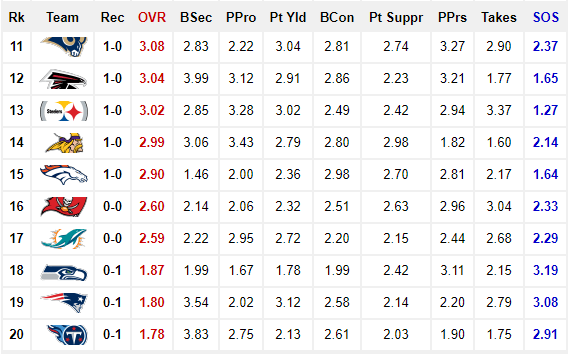 Needless to say, their performances were instrumental in the Chiefs ranking No. 2 in BES Offense. Meanwhile, the Jaguars (1-0) sent shock waves through the mathematical mechanisms of the BES with their 29-7 manhandling of the defending AFC South Champion Houston Texans (0-1) . Their No. 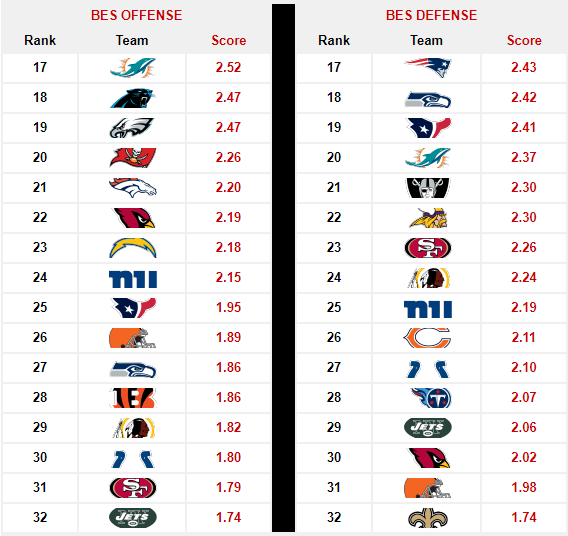 4 ranking in BES Overall is 24 spots better than their 28th place finish in our final BES Rankings of 2016 . Anchored by their No. 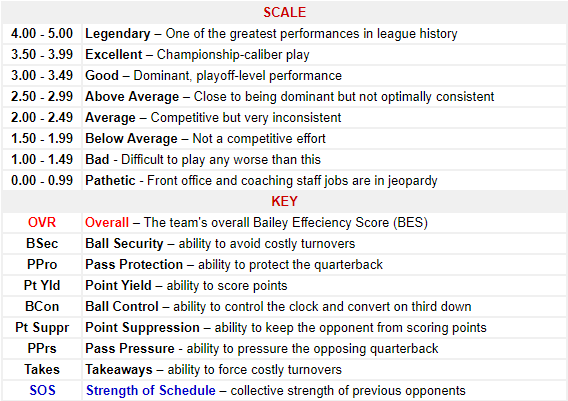 6 BES Defense, they will host a more offensively potent Tennessee Titans (0-1) squad in Week 2. 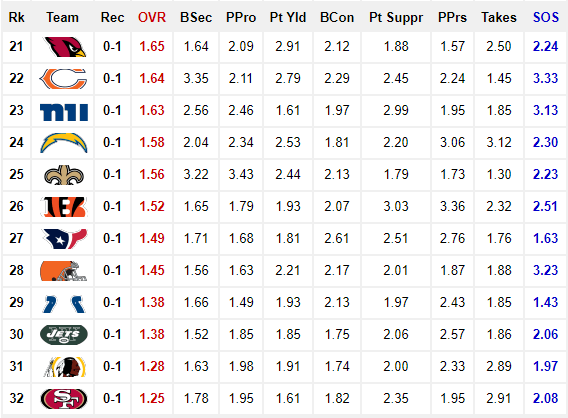 Outside of the BES Top-10 are a trio of +3.00 teams, most notably of which is the Rams (1-0) who were offensively explosive in their 46-9 thrashing of the Colts (0-1). More impressive was their stifling No. 7 BES Defense under renown defensive coordinator Wade Phillips. However, they face a slightly taller task when the Redskins (0-1) visit in Week 2.